The basic plot concept behind Claymore is nothing shocking  but it is done well. Humankind is under attack by monsters, so some of the humans partake of the monsters' flesh to become a hybrid that then has the power to defeat the monsters. You may remember this premise from elsewhere and would be forgiven for not thinking it entirely original. However this simplicity is a major strength of the series as it allows the storyline to revel in all of the different possibilities, developing over time with many extensions and permutations rather than skipping off to find something entirely different whenever a plot point has run its course. The art in Claymore succeeds on many fronts that enhance the title as a whole, and make it refreshing to read. While the setting itself is from generic European feudal county number 24½, the quality of the drawn backgrounds is impressive, and the unified architectural style makes the places feel like more than just potential battlegrounds for the characters to mess up. In addition to the backgrounds, the characters, clothing, and monsters all have their own established style  taken together the world feels like a completed whole. This is especially true of the main characters themselves, who despite all having the same basic template (taciturn albino lady with a sword) come across as real individuals that you can tell apart at a glance due to their unique characteristics. In addition, almost all of the monsters presented in the series are outstandingly different from one another while retaining a few set artistic rules that you can see carried between them. You can easily imagine all these things co-existing in the same world, which helps maintain suspension of disbelief, leaving you to happily truck through the manga without any niggling worries about consistency. The art during action scenes has a fluid simplicity to it, allowing you to follow the attacks easily and understand what exactly is happening and to whom. This sounds like a rather obvious thing, but it would be so easy to fail at this key element and, in doing so, make the combat sequences an unclear mess. The clarity of the art also helps in showing damage to the characters and the surroundings, upping the tension even further. As a result you can happily skip your eyes from panel to panel and easily follow along with the action, making the whole thing much more tense and, to be honest, badass. Even better is that my favorite aspect of art in fighting manga, the crazy face, is in full effect in this title. Some of the battle sequences have an average of up to two and a half mad grins per page! Sure, the combat is amazing, exhilarating, and consistently well drawn, but you only feel invested in these fights because of the characters involved. Unsurprisingly, half-monster hybrid warriors are rarely a happy bunch and get exposed to quite a lot of tragedy, through which you come to know them and what motivates them. The individual actions and pieces of dialogue are well written and flesh out the characters nicely so you get to know them. Not only the characters themselves, but their interrelationships have a feeling of weight that grounds the various actors as individuals. Even a character who only appears for half a volume has impact and those who survive them are affected by the loss. Of particular note are a pair of characters who are introduced rather early on, Helen and Deneve. The "odd couple" of the series, they have wonderful interaction between themselves and others every time they appear in the storyline and are a particular highlight of the cast. The primary reason I enjoy this manga is the brisk pace with which it conducts itself; conversations last as long as your attention span, fights never feel as if they are dragging on, and you are not left wondering for long what happened to missing characters. This is especially apparent whenever there is a flashback or side story, which is executed without discontinuity in the flow of the story. However, there is one important issue that I, and any paying reader, will have with the manga that should not be overlooked. 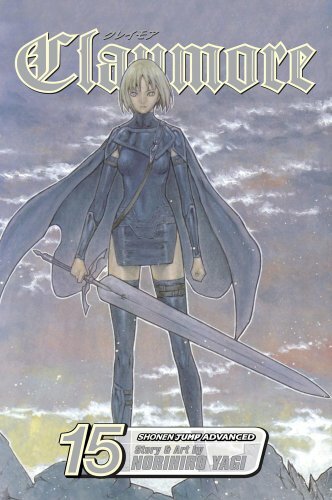 Due to the streamlined art, plot, and pacing a volume of Claymore does not take very long to read, and takes markedly less time than other manga. Re-reading the currently released volumes was much quicker than I imagined it would be  while it was immensely enjoyable, it hurt to realize that each book I absorbed in about twenty five minutes had cost me seven British pounds. A similar worry was outlined by Erin Finnegan in her Shelf Life column, which contains a review of the Claymore anime series. For a concrete example, the recently released 15th volume contained an amazing fight scene, a colossal plot bomb, the re-introduction of a key character, another plot bomb, and an additional fight scene. Sounds exhausting, doesn't it? The whole lot, which I read in the comfort of my bed on a Saturday morning, took the grand total of half an hour. Even worse, the next volume is not due out until June 2010, a long time to wait for another 30 minutes of awesome action. Despite this financial worry, I would still certainly encourage you to take a look at the series to see if its wonderful display of exuberant, violent action takes your fancy.